One of the oldest longstanding and protracted conflicts, the still ongoing armed struggle in Colombia has been relegated to the back files of media attention as a permanent fixture of conflict and violence. 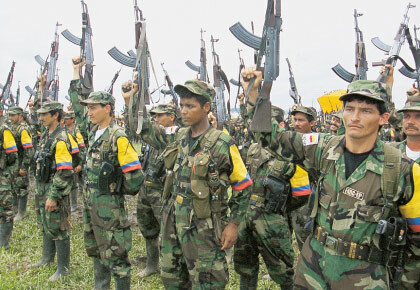 Opposing the Colombian government and a series of criminal and insurgent groups, the most prominent of which is the 8,000 strong Marxist-Leninist Revolutionary Armed Forces of Colombia (FARC), the conflict has caused 220,000 deaths and more than 5 million Internally Displaced Persons in its 46 years of existence. In its latest blog series, ISIS Europe hopes to draw attention to those countries that once used to be at the centre of attention of media and policy-makers, but that have recently been overshadowed by other topical conflicts. Although the ongoing insurgency led by the FARC is world renowned, European interest in the Colombian conflict resurges only when its citizens are somehow involved, mostly taken hostage by the revolutionary guerilla. Highly mediatised in Western Europe in the framework of the 6-year long captivity of French-Colombian Ingrid Betancourt, or with the surprising story of Tanja Nijmeijer, a young Dutch woman who became a member of the FARC, there is only little knowledge and understanding of the conflict that has been tearing the country apart over nearly five decades. As peace talks were recently reopened by President Santos, with breakthroughs being announced in the past weeks on some of the items of the agenda, one has to bear in mind that this is the fourth time parties resort to the negotiating table. If the context and the power relations were clearly different each time, successive failures are overshadowing ongoing efforts for a peaceful resolution of the conflict. Social and economic causes of violence are to be found in the origins of the Marxist-Leninist insurgencies that are contesting the established political order. Proclaiming itself “El ejército del Pueblo” (or, “People’s Army”), the FARC claims to represent the struggle of rural, agrarian classes against richer classes and the central government, considered to be authoritarian, corrupt, undemocratic, monopolising natural resources and vulnerable to US imperialism. The land and the situation of the peasant are, thus, originally at the core of the FARC’s struggle in a country that has experienced large-scale land grabbing at several stages of its history. Colonisation initiatives and struggles for the control of remote areas, either through the promotion of nation-building initiatives by the central government, or through the development of alternative political, social and economic structures for the peasantry by the FARC, have become common practices on both sides. Since the 1980s, illegal drug trade has become a matter of widespread importance to all parties involved in the Colombian conflict. As part of their claim to represent rural and agrarian populations, guerillas have extended their control to remote areas by providing protection to coca growers from eradication campaigns, allowing them to grow and commercialise coca in exchange for a “tax” imposed on cultivation (money or crops) since the 1990s. In later years the FARC have been involved in all stages of the drug business, from production to shipping, as a means to finance their fight. While guerrillas, drug lords and paramilitary have competed for their own shares of the market, pressure from the US government and critical sectors of the Colombian society escalated the conflict. Corruption, murder of officials, politicians and of others who stood in the way of drug-related activities increased. Progressively dismantled by the Colombian government, with massive financial, logistical, tactical and military backup from the United States, the Colombian government is now increasingly raising its voice for a review of international policies against drug trade, calling for a shift from targeting coca-producing countries to cocaine consuming ones. Extortions and kidnappings have also been main sources of income of brutal paramilitary groups and of insurgents in the past decades, and all of the parties engaged in the conflict have been criticised for numerous human rights violations. Considering themselves to be “victims” of an authoritarian government and of political prosecution, the FARC purport to be the sole representative of the rural and peasant classes of Colombia. Although the extent of public support for the FARC can legitimately be put into question, the question of political participation of the FARC in the event of a peace agreement is central. Following the 1982-1985 peace talks, the FARC entered political life with the creations of the left-wing political party, the Patriotic Union (PU). It is evaluated that by 1990, around 5,000 members of the PU had been murdered by paramilitary groups, sometimes in connivance with the military. An antecedent which has clearly undermined confidence between parties in later talks to give up the armed struggle and enter the political process. The ongoing hermetic peace talks held in Cuba for the possible termination of the conflict have received limited coverage outside Latin America. The meetings aim at achieving a ‘general accord for the termination of the conflict’ and allow the FARC to enter the political process and renounce the use of violence. No ceasefire has been concluded as a precondition for the entrance into negotiations, with both parts agreeing to the principle that “nothing has been agreed until everything is agreed”. It is also in this perspective that very little information is being released regarding the arrangements made. The agenda set for the peace talks revolves around six points. 1. Rural development and land reform: An agreement was reached this year, although its exact content remains unclear. A central driver of the insurgency, the issue of land possession is ranking high on the FARC’s agenda. The government recently passed a law for agrarian reform, for the restitution of land to peasants. It has been pushing for the insurgency to recognise the efforts made by the administration in this area. 2. Political participation of the FARC: An agreement was just recently reached although little is said about the exact content. There have been talks about the creation of special “conflict circumscriptions” to allow the regions most affected by violence to have privilege access to congress for a definite period of time. 3. Illicit Drugs (next point in the agenda – talks will begin in a few weeks): This item promises to be a most contentious one, as the FARC purports they are not involved in the business. They consider narcotics to be a symptom of Colombia’s socio-economic dysfunctions, in great part believed to be caused by U.S influence. Manuel Santos has been advocating for an “international approach to the drug problem”, which would imply tackling the problem of drug consumption rather than targeting producers who, often, do not have any viable alternative. He has been lately raising his voice calling for steps towards “decriminalisation short of legalisation”, which, however, is not being echoed by Washington. Given the fact that the issue transcends Colombian borders, any agreement runs the risk of limiting itself to stating generalities, such as “there is a need to change world drug policy”. 4. Victims: The issue of victims is one of the most sensitive ones. The FARC have openly expressed their view that they actually are “the” victims of an overly authoritarian government and of political prosecution. Although considering that the main actor responsible for violence and repression is the state, they have recently admitted that they may have some victims to account for. The government is believed to be looking for an agreement along the lines of the ‘Legal Framework for Peace’ recently passed by Congress, which is a more lenient framework of transitional justice to allow FARC combatants to enter the political process. Strongly criticised not only by human rights advocates, but also by former President Alvaro Uribe and the right wing, because it is considered to foment impunity, the FARC also reject this option which would still inflict minor sentences on (some of) their members. The other point the Government will look for an agreement from FARC in on another government law that is connected to the one of Land Restitution for Victim, and talks about paying reparations to victims from the national budget. 5. Disarmament: The government wants the FARC to fully disarm. On the other hand, the FARC has maintained they will not do so, because weapons will serve as a guarantee and protection in the post-conflict period, recalling that the political party they had created in the framework of a previous attempt for peace, was decimated. Analysts foresee that an alternative solution similar to the one applied in Northern Ireland in 1998 with the Belfast Agreement, could be agreed on. In such an event, the FARC could be allowed to keep weapons for a period of time until final decommissioning. 6. Ratification of the Accord: Parties will have to agree on the means to validate the process. The FARC have been talking of a constitutional assembly, an option which has been rejected by the government. As a response, the government has proposed the idea of a Referendum which would give the Colombian electorate the opportunity to ratify the process. This will be the last item to be put on the table. Although only opening the third item on the negotiation agenda in a few weeks, the government wants a final agreement to be signed by the end of the year, in advance of the presidential election of May 2014. However, the most contentious points remain to be discussed, and negotiations will have to be speeded up if they are to respect the said timeframe. And there is, thus, a long way to go until technical arrangements, implementation plans and concrete commitments are agreed upon for the successful conclusion of the negotiations. Peace, stability and alternative development is one of the three pillars of the EU’s holistic strategy as spelled out in the Country Strategy Paper (2007-2013), aiming at simultaneously tackling different components of the conflict. The latest Country Strategy Paper clearly stresses the Union’s support for a settlement of the conflict, the promotion of peace, reconciliation through DDR processes (demobilisation, disarmament and reintegration), and the efficient and systematic implementation of the Justice and Peace Law. This area consists in providing assistance to the victims of violence, to communities affected by the internal conflict (in the form of emergency and post-emergency measures through non-programmable aid), and in providing support for a negotiated solution to the internal armed conflict. Justice and Human Rights constitute the second pillar. While recognising that some progress has been made, Human Rights still appear at the top of the focuses of the EU in its relations with Colombia, and the commitment of the EU to human rights has recently been confirmed by the establishment of the EU-Colombia HR dialogue, in 2009. The promotion of human rights, good governance and the fight against impunity, as well as the strengthening of civil society by encouraging citizens’ initiatives, meetings and associations, are part of the medium-term goals of the Union in Colombia. Finally, the European Commission’s Department General for Humanitarian Aid and Civil Protection (ECHO) has provided more than €187 million in humanitarian aid in Colombia to help people affected by the conflict since 1994. Colombia has the second largest population of internally displaced people in the world: 4.8 million according to the government and 5.5 million according to local NGOs. It has also forced civilians to flee to neighbouring countries – mainly Ecuador and Venezuela. According to the UN refugee agency, UNHCR, almost 396.000 Colombians are in need of international protection in those two countries alone. Civilians in Colombia continue to be affected by the humanitarian consequences of a decades-long internal armed conflict: forced recruitment, sexual violence, murder, disappearances, restriction of movement, lack of access to goods and services and forced displacement. For 2013, €13 million have been granted to assist the victims of the conflict, same amount as in 2012. Also, Colombian children (IDPs and refugees) are among the beneficiaries of the Nobel Peace Prize children in conflict projects, towards which the European Union decided to channel the funds awarded by the Nobel Peace Prize in 2012. Helping people affected by natural hazards such as floods or earthquakes is also at the core of ECHO’s mandate. In 2011-2012, ECHO’s Disaster Preparedness programme (DIPECHO) invested €1.9 million in projects in Colombia. Relatively silent on the ongoing peace talks, the High Representative has issued a few statements welcoming the reopening of the negotiations and the achievement of an agreement on land reform. At a recent meeting between Colombian Defence Minister Juan Carlos Pinzon and Deputy Secretary General Schmid, the possible deepening of EU-Colombia dialogue and co-operation in the field of the Common Security and Defence Policy (CSDP) and for EU assistance in the area of military penal jurisdiction were discussed. Although still a recipient of EU development and humanitarian aid, Colombia’s dynamism, and growing regional importance makes it a principal partner for the EU in Latin America. This entry was posted on 14/11/2013 by ISIS Europe in Behind the headlines, Myrto Hatzigeorgopoulos and tagged Army, Cocaine, Colombia, Conflict, Country Strategy Paper, DDR, Disarmament, Drugs, Drugs trade, ECHO, EU, European Union, FARC, Guerilla, Land reform, Military, Peace talks.